Hi! Glad you decided to read this post, despite the name. 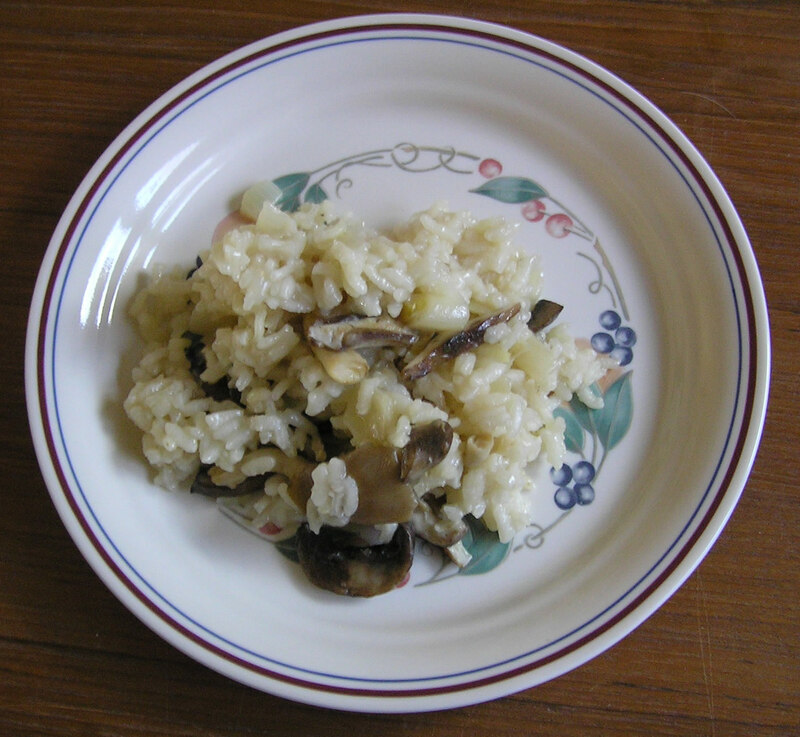 Most risottos require you to stand there and feed the broth, a little at a time, until all of it is completely added and absorbed. This boring slow process is normally the key to a creamy risotto. Until now. 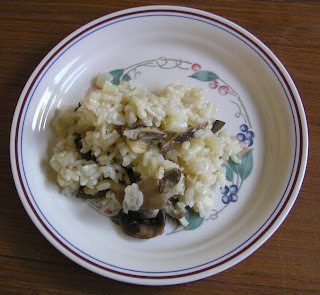 I was going to add cheater or lazy to the title because, unlike a normal risotto, most of the broth is added at once. Due to the long cooking time, the arborio rice magically swells and become creamy yet retaining the tiniest of bite that risotto is famous for. I used wild mushrooms because a package of pre-sliced almost literally fell into my cart while I was slaloming through the crowded veggie section of the market. The mushrooms were so fresh and cute that I decided to take them home and figure out what to do with them later. 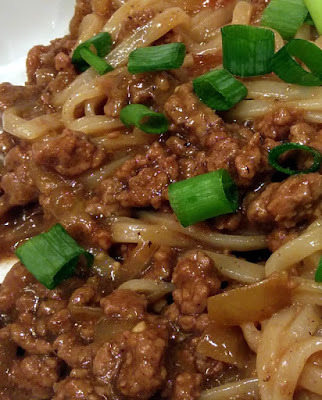 White button mushrooms can be substituted. They won't be quite as pretty, but they are much cheaper. White wine gives additional flavor, and it is 5 o'clock somewhere, but more broth can be substituted. 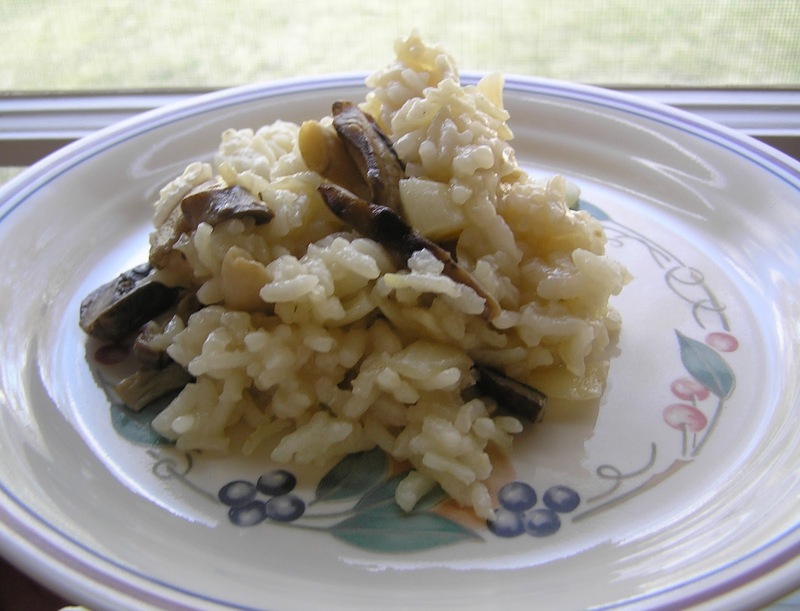 Don't substitute regular long-grain rice for the Arborio, however. 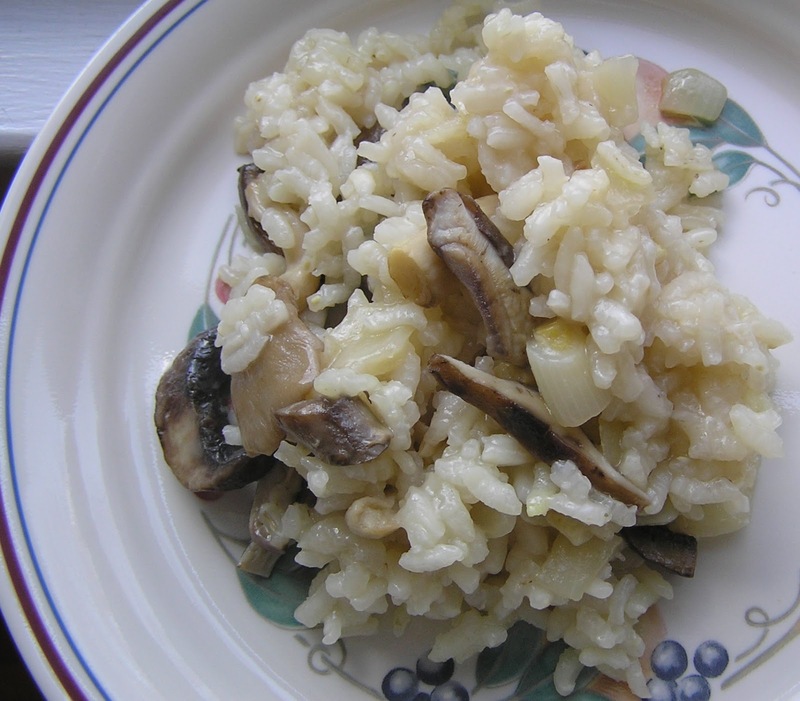 Regular rice will become very mushy, and not in a good way. Heat the oil in a nonstick pan. 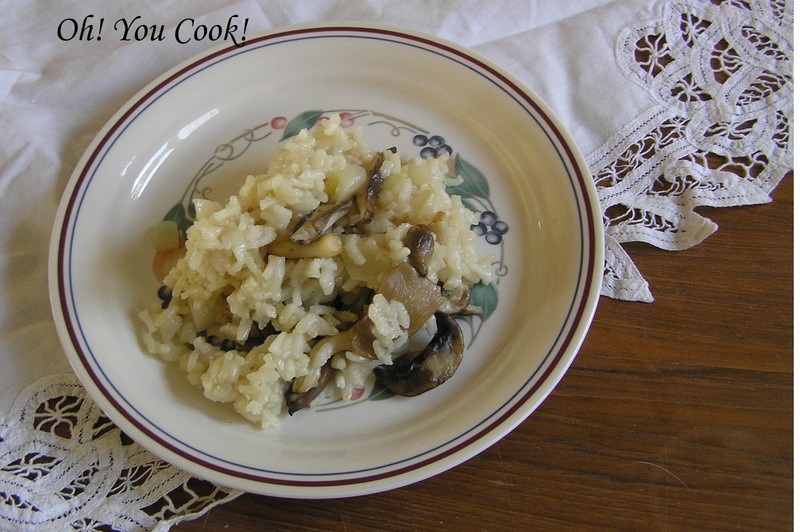 Sauté the onion, garlic, and mushrooms until soft, about 4–5 minutes. Stir in the 1/2 cup broth and the rice and cook until the liquid is fully absorbed, about 5 minutes. Transfer the rice mixture into a 4-quart slow cooker. 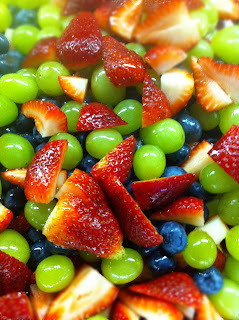 Submerge the mixture with the water, wine, salt and remaining broth. Cover and cook on high for 1½ - 2 hours or until all the liquid has been absorbed. Stir in parmesan cheese and butter. 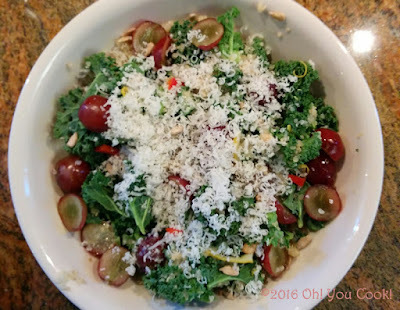 Sprinkle with parsley and/or additional Parmesan cheese, if desired, before serving. Oh, I wish my family liked mushrooms more. This mushroom risotto looks so delicious! After cooking on high for recommended time, can I put it on simmer and then add the last ingredients? I want to bring this to a noonish lunch, so I thought I could sautee in advance at home and then cook at high as recommended at work, then simmer til lunch or should I not add to crock pot until ready to cook at high for 2-2 1/2 hours? Does this make sense? Even on high the food just simmers ... do you mean warm rather than simmer? I think you can cook on high at work, then turn it down to warm safely for a few hours until lunch. Then add the parm cheese and butter just before you are ready to eat. Have you added Chicken to this?? No, because of the cheese and butter. However if you are not kosher (or omit the above ingredients), then feel free to add it to your serving.